Familiar to many people as a key ingredient in curry powder, turmeric, which originates in southern Asia, has a long history of use in both Ayurveda and traditional Chinese medicine. 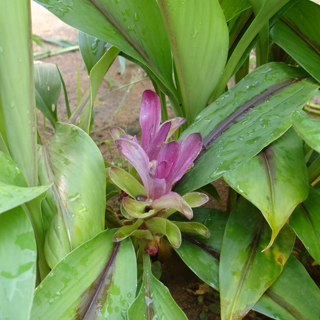 It is largely used for digestive and liver disorders and to heal allergic and inflammatory conditions, although modern research also suggests that it has potent antioxidant properties and can reduce cholesterol levels. Curcumin, one of turmeric's most thoroughly studied active ingredients, reduces the formation of fat tissue by suppressing the blood vessels needed to form it, and therefore may contribute to lower body fat and body weight gain. Drink 1 cup (1 tsp herb per cup boiling water) up to 3 times daily for digestive problems including nausea, gastritis, excessive stomach acid, indigestion, and liver or gall bladder disorders. Can also be combined with remedies for arthritis such as angelica or devil's claw and taken 3 times daily. Take 40–80 drops (2–4ml) in a little water 3 times daily to help reduce blood cholesterol levels, or take 1 tsp (5ml) up to 3 times daily for period pain. Take 1/2–1 level tsp (1–2g) stirred into a cup of water, fruit juice, or milk for arthritic problems or eczema. Apply 2–3 times daily for athlete's foot, psoriasis, or ringworm. Prefers moist, fertile soil with high humidity and partial shade. Will only grow in warm regions (minimum temperature 59–64F/ 15–18C), but can be cultivated under glass elsewhere. Sow seeds at 70F (21C) in autumn. Alternatively, propagate by root division while the plant is dormant in winter or by root cuttings in autumn. The rhizome is dug in autumn and is boiled and steamed before drying.